In order to facilitate the declaration of alerts made by whistleblowers and to strengthen their follow-up, the National Agency for the Safety of Medicines and Health Products has set up a procedure via a specific e-mail address. This procedure is in line with the French law on transparency, fight against corruption and modernization of economic life. It concerns health or cosmetic products. 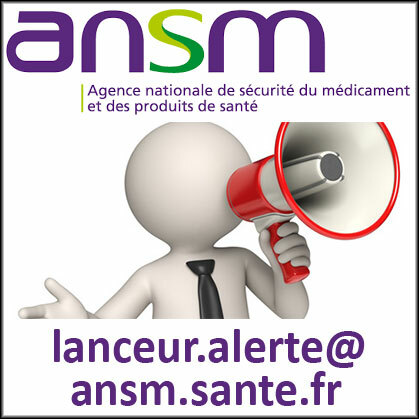 The address lanceur.alerte@ansm.sante.fr, accessible on the home page of the ANSM website, now allows any person who has personal knowledge of it to easily report any serious violation of a law or regulation or any serious threat to the public interest, concerning health or cosmetic products intended for human use or activities falling within the scope of ANSM’s competence. This may include, for example, non-compliant practices by an operator operating on these products (manufacturer, distributor, etc.) or any serious threat to public health related to a health product. This procedure does not apply to other reports that benefit from specific reports: reports of quality defects, reports of adverse reactions or medication errors and reports of stockouts. Through this procedure, the Agency shall ensure that the alert is examined, that the first response is given to the person who issued it within a very short time and that the confidentiality of the information collected and the identity of the whistleblower are strictly respected, and that he or she also benefits from the protection measures provided for by law, in particular vis-à-vis his or her employer. In order to facilitate the analysis of the alert, particularly if additional information is required for its processing, the ANSM advises to avoid anonymous alerts. The protection of the whistleblower, provided for in the texts, is applicable in the event of good faith use of the device, even if the facts subsequently prove to be inaccurate or do not give rise to any action. Conversely, the denunciation of inaccurate facts may expose the perpetrator to possible judicial, administrative or disciplinary proceedings. Following an alert, its author, if identified, receives within 72 hours an acknowledgement of receipt with the registration number of the alert. If the latter does not fall under the alerting procedure, the author shall be informed and, where appropriate, of the redirection of his message (to another service of the Agency or to another administration). Within 30 days, the person issuing the alert shall be informed of the admissibility of the alert and of the means and time limits by which he will be kept informed of the action taken on his alert. The action taken by the Agency on these alerts may be various: triggering an inspection, analysis of a product by the Agency’s control laboratories, verification of the files initially submitted by operators, etc. • the postal address: ANSM - DAJR, 143/147 Boulevard Anatole France, 93285 SAINT DENIS CEDEX, indicating on the envelope “Alerte - confidentiel”.